When we got the trailer home, I filled the tank, and quickly found out that the tank and lines still had winterization stuff in them (pink stuff). After filling the tank and running all the faucets 4 times, from full to empty, then dumping the gray water tank, the water is now clear, but still slightly "sudsey". Is there a way to simply fill the fresh water tank, and drain it directly to ground, without having to keep opening the faucets and running the water pump? Yes, typically there is a drain valve. On our 2003 Cougar the fresh water drain was on the bottom of the tank hanging below the camper. Look underneath you may find a valve with a very short section of hose hanging down. Excellent! I'll give it a look-see in the morning. Thanks a million! Ok, so bear with the newbie... Jamie, you might be best at answering this, since we have/had similar yr models of the Cougar. We have a trip planned to camp on the range at a shooting match this coming week. The only service is the 30-amp, so we'll be carrying a full fresh water tank. I understand the weight issues with the water, and have planned accordingly. If you would, give me a quick checklist of what I need to do, once I have the RV parked, levelled, chocked, and the stabilization jacks are down. (the water and hot water "gotta-do's" are biggies here). Also, any things that I might want to avoid doing, lol. You'll want to keep an eye on the tank gauges while you're there--although with a unit that old the gauges may not be functioning properly. That really is your biggest challenge: Accurately determining how much fresh water you have and how full the tanks are. Especially if you're staying a full week. For a week I don't think I'd plan on bathing too often in the coach; if you do you'll want to take extreme Navy showers! Aside from that: You'll have power so you can use all the appliances; including the A/C. We'll be on-site from Wed evening thru Sun morning, then heading home. One question I haven't been able to find the answer to in the rather-vague owner's manual is regarding the hot water system. With the fresh water tank full, does the hot water tank get it's water supply automatically, or do I need to do something else to get water to it, before firing up the heater? The water heater is supplied via the same plumbing as the cold water. You only really need to make sure that there is water in the heater before turning it on (mostly so that you don't burn out the electric element should you decide to use that option). You'll want to find the water heater on the inside and look for any winterization valves to ensure that they are set to let water into the heater. Don't put too much faith in your waste tank gauges, especially the black tank. It is common for the gauges to get contaminated and indicate that the tank is more full than it really is. In time you will learn how badly your gauges are messed up. For that length of time you can get one of those "blue tote tanks" to bleed off gray water if need be. Black tanks should hold up if they are for sure empty and you do "navy poops". I carry a 20 gallon on long dry trips JIC. Nothing worse than standing in 2 inches of shower water with a head full of shampoo (assuming you have hair). There are several manufacturers...just make sure you don't fill it up before shutting off the RV valve. Ok, so if I'm understanding things correctly (which may be a HUGE stretch! ), to operate the hot water heater, I turn on the gas supply, give it a few minutes to get gas in the line, then go inside the trailer and turn on the hot water switch. The fresh water tank is full, and I'm getting water out of the hot water faucet on the kitchen sink. (see pics). I don't see a way to get to the back of the heater, to check for bypass valves, or winterization switching. Also, didn't see anything obvious underneath, that might suggest a fresh water drain valve, but I did find two small hoses (see pic below). The two hoses are the low-point drains. On the inside of the coach look for a panel or drawer that you can remove that is in the same spot as the water heater is on the outside. On our Cougar the water heater was below the stove. There was a panel with two screws that I could remove to get to the winterizing valves there. Likewise with the drain: Find where your freshwater tank is and look underneath it or near it. Since the unit is older it is possible that a previous owner did something with the drain as well. Ok, call me blind AND stupid... found the access panel. If it was a hand grenade, I wouldn't be typing right now. LOL. So, here's what I found. There's a valve on the lower pipe (cold) to the left in the pics. The valve is in-line with that pipe. Sorry for the poor lighting... the overhead lights weren't helping, and I had a small flashlight I was trying to hold correctly while operating the camera phone. That looks right. If I remember correctly--its been a few years. There was only 1 valve (I believe there was a check valve at the hot water out) so that when its turned one way the water bypasses the heater and the other way goes through it (actually a little simpler than the 3 valve setup in my Axis LOL). 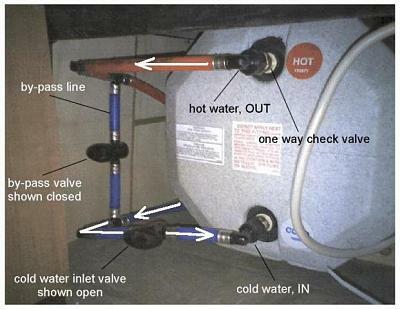 From your picture I'd guess you're set as the valve is inline with the cold water intake (point the valve perpendicular to the cold water intake for winterizing). In addition: Your picture of the switch would indicate that you probably don't have the electric option so you may not have to worry about burning out an element (that doesn't exist in your trailer). Given what we're seeing: try it. Turn on the water heater for a bit and then open a faucet to see if warm water comes out (if you don't want to put any in the grey tank use the outside shower). You shouldn't have to wait for the water to come up to full hot...just long enough so that its warmer than the "cold" water. Got it! And thanks again for all the help. We got a 15 minute walkthrough on the unit, the day we picked it up, then went out for driver training and backing-up. We probably went into sensory-overload at about the 12-minute mark of the walkthrough. On the back side of the water heater this what it should look like. One other note...bleed the air from the gas lines by turning on a couple stove burners for a few seconds before lighting the water heater...if you haven't done this yet.